We tore it up on 9News last week for their Workout Wednesday series and have had great feedback from our friends. As personal trainers, we work on functional training, which means training for everyday body movements. What you learn in the gym should translate into your movement in real life. You twist here, bend there, lift like this, and so on. Some of it is about speed, some is about range of motion and, as always, there’s a focus on how the entire body works together. Training for running (or anything) isn’t about isolating a specific muscle group. It’s about total body training to build strength and stamina, and prevent injury. 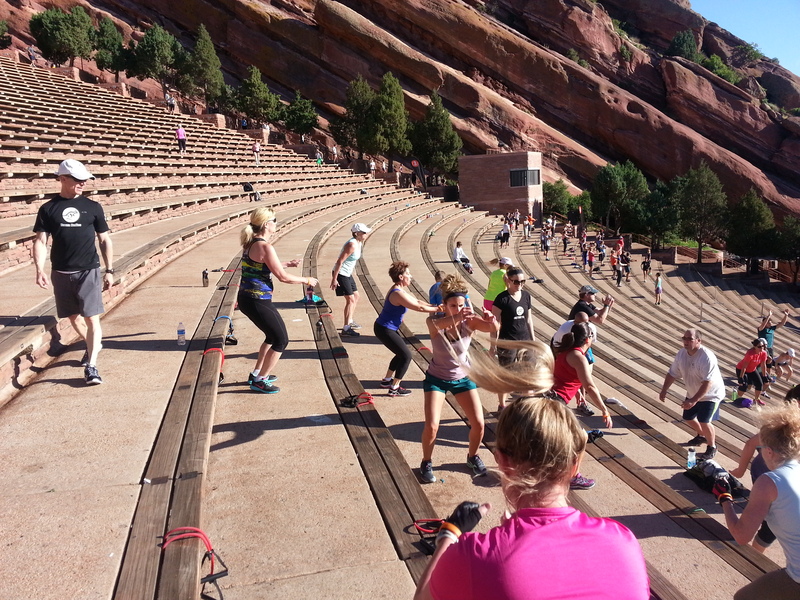 Give these exercises a try at home, and join us in one of our classes — or at Red Rocks! — for more. Look! Up in the sky! It’s me, Jamie Atlas (eh-hem, 5280’s Top Personal Trainer) riding a broom! Okay, not really. But I’ve been having a lot of fun with my friends at 9News on their Workout Wednesday series. We’re talking workouts, nutrition, fitness — and fitting it into real, daily lives. So as part of my functional training philosophy, I like to create workouts that can be done at home, at your desk, in a house, with a mouse… And incorporating whatever you have laying around. If it’s pushups at your desk, lunges while you pick up the kids’ toys or, in this case, a broom. And these exercises have varying levels of intensity. Check out these simple exercises I taught Corey Rose at 9News. In just three functional movements, we’re getting our heart rates up and activating several parts of the body at the same time. See? Fitness doesn’t always have to mean going to the gym or hiring a personal trainer. You can get a great workout and a dose of daily activity by getting creative and using what you have. Now, bag up your canned food and go! 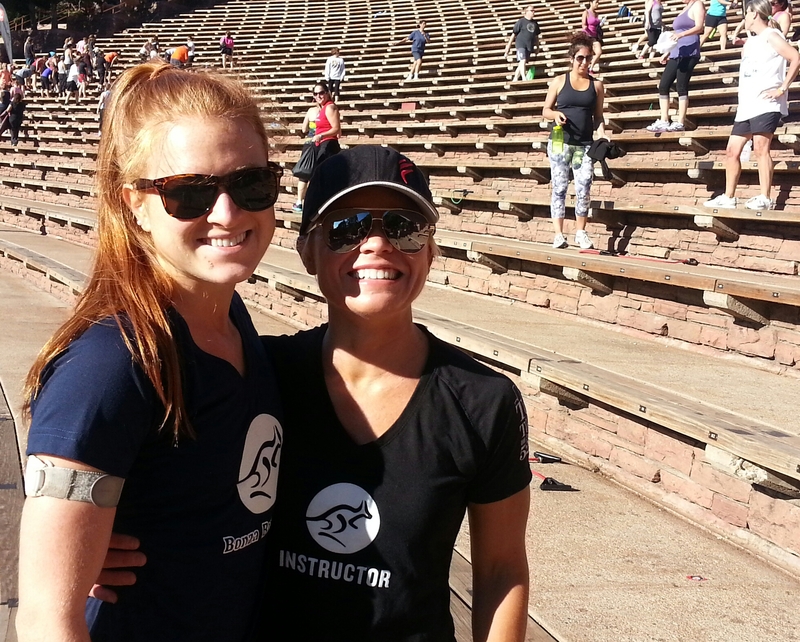 As trainers, we talk a lot about fitness, functional workouts, weight loss goals and how awesome it is to work out at Red Rocks. But when I’m doing my personal training thing and working with my clients, I also maintain a large focus on nutrition and healthy eating because I understand that a fit and functional body is fit and functional from the inside out. So let’s talk about food. We all know the old saying that breakfast is the most important meal of the day. You know, because nutrition is important, because it kickstarts your metabolism, fires up the ol’ brain cells and preps you for a day of productivity. And that’s all well and good, but let’s be honest: there’s more to it than that. Breakfast food lives on a bit of a spectrum that I like to break down into red light, yellow light and green light foods. While it’s easy to identify donuts as America’s favorite breakfast– uh, I mean, as a red light, some foods are a little harder to classify. Turns out the yogurt was our red light. Why? Because of those sneaky artificial sweeteners that will actually create inflammation in our bodies. How do we convert that to a yellow light food? Eat real yogurt with no sweeteners and add some berries. Our green light, despite concerns about cholesterol, was the eggs. And oatmeal was the yellow light. So think about that next time you’re bellying up to the breakfast buffet — it’s only the most important meal of the day if you’re making good choices. 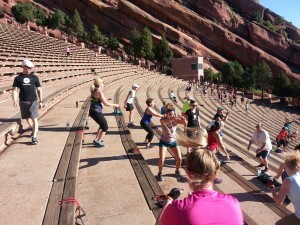 The summer season started out with a lot of questions about the new system for fitness classes at Red Rocks. We’re happy to report that the changes haven’t gotten in the way of good times (for us trainers, anyway [insert diabolical laugh]) and great workouts. Smaller class size means you get to know your neighbors, and your trainers. This puts the “personal” back in personal trainer. And at Bonza, we have some cool peeps you’ll be happy to know. We’re watching you. Yep, in a small group, everyone’s accountable. There’s no hiding in the back row, doing half a set and then taking a breather. We’re all in this thing together and we’re excited to work with you on your weight loss and fitness goals. Quality over quantity. If you like crowds, come for a concert. If you like running stairs without tripping over people, join us for a workout. Need more proof? Look at these Bonza bodies, all happy and hardworking and stuff. Then come see for yourself.